In spring 2016 a pair of fieldfares has built a nest utside my office window. On Friday April 8 I noticed activities outside the window. Until evening the shape of the nest had been established. On Saturday April 9 I installed the first version of the webcam. The nest itself is reinforced with clay. There is not much activity on Sunday April 10 – the clay is left to harden. On Monday April 11 the nest is lined with a soft layer of hay. Starting on Tuesday April 12 and including Saturday April 16 the female bird lays one egg each day. The female starts to brood the eggs fulltime on Sunday April 17. On Wednesday April 27 the first four eggs hatch. 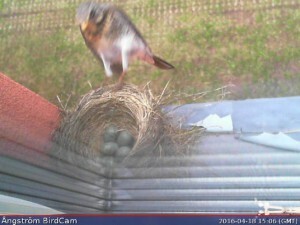 Now both parents come to the nest regularly and with big amounts of food. The last egg hatches on Thursday April 28. Monday May 2 the happy family life in the nest ends. A crow strikes several times and grabs one chick after the other. The fieldfares received reinforcement from 2 other fieldfares, chasing the crow, but in the end they did not manage to defend the nest.